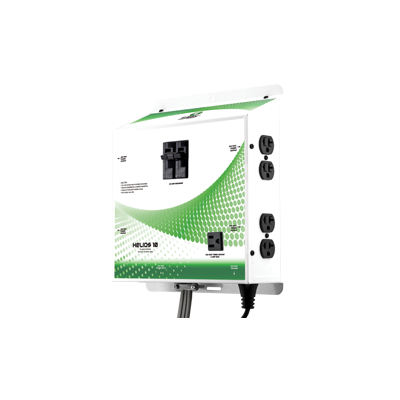 The Helios 10 lighting controller is speciﬁ cally designed for operation of high intensity discharge (HID) lighting systems. The controller will run your lights for any sequence over a 24 hour period by using the dual 120 Volt relay activation cord set and plugging them into a 24 hour wall timer. The system can handle up to a maximum of eight (8) 1000 watt HID metal halide or high pressure sodium (HPS) grow lights. 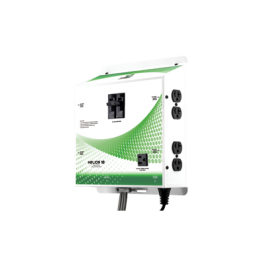 This lighting controller provides up to 40 amps of capacity on a standard 240 volt circuit. There is a 120 Volt accessory outlet (maximum of 2 Amps) on the front of the controller. This is intended for use of a ventilation fan or light mover and is only active when the lights are on. The Helios 10 is built with only the highest quality components and will provide the user with years of trouble free service. Only for use with 240 volt ballasts.